It was yet another interesting night in the Stanley Cup playoffs yesterday with the Rangers evening their series with Montreal with a hardfought 2-1 win, the Blue Jackets staving off elimination with a 5-4 victory at home over Pittsburgh, and the Sharks blowing the doors off the Oilers, winning 7-0 to tie that series 2-2. 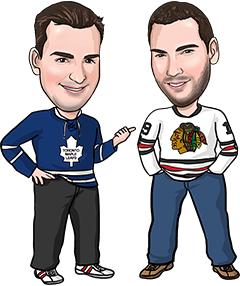 We sat out yesterday’s games after making a half-unit profit Monday, hitting the Flames Team Total Over 2.5 but going 0-1-1 on our half-unit plays on the Blackhawks first period moneyline and full game moneyline. Both the games and the betting lines are very tight at this time of year, so we’re trying to be pretty selective and pick our spots. Going with two Team Totals tonight, though the one is at a bit juicier odds than we normally like. Good luck if you’re tailing along, and enjoy the action! All the pressure is on the Capitals as they desperately look to avoid another early playoff exit following an outstanding regular season. The big question is whether that pressure will smother them or whether they can rise above it. Usually, Washington’s playoff failures come from a lack of offence. That hasn’t been the Caps’ issue in this series, as they’ve put up 3 goals in each of the first 3 games. Defensively has been where Washington’s struggled, allowing 2 quick goals to the Leafs in Game 1 and then giving up 4 in each of the past two contests. Whether Washington wins tonight or not, we think they’ll score some goals once again here. The young Leafs have allowed 3+ goals in 7 straight games and 8 of 9 dating back to the regular season, and they’ve also given up 3 goals or more in 9 of their last 10 meetings with Washington. We went with the Flames Team Total Over 2.5 -118 instead of Flames -130 moneyline the other night in Game 3 and were glad we did. Calgary poured on the offence early and often, building a 4-1 lead before the midway point of the second period, but the Ducks stormed back to win 5-4 in OT. A lot of the reasoning for that bet still applies tonight, though we’re looking to bet the Ducks Team Total Over 2.5 here instead of the Flames. Our reluctance to take the Flames moneyline Monday was because Anaheim’s been so hot offensively, and the Ducks have now scored 3 goals or more in 12 of their last 13. That’s the big reason Anaheim is 9-0-2 in its last 11 outings (and 16-1-3 if you extend it over their last 20).